Cazalis, a doctor by profession, was a part-time poet and friend of Mallarmé. He was a member of Chausson’s circle and was responsible for giving the Hebrew cabalistic name ‘Nabis’ (prophets) to a group of Post-Impressionist painters (Maurice Denis, Edouard Vuillard and Pierre Bonnard among others), many of whom were Chausson’s close friends. For his very first song, Chanson triste, Henri Duparc had turned to Cazalis’s first volume of poetry, Melancholia (1868. published under his own name). By the time the poet issued L’illusion (1875) he was writing under the pseudonym Jean Lahor. The poem Nocturne from this collection was set by Duparc as the immortal Extase. When Chausson decided to set Sérénade mélancolique from the same volume it was natural that he should conceive it as a tribute to his beloved friend Duparc. In the event, Chausson makes alterations to Lahor’s first two verses (he refuses to set the sexually explicit ‘Enveloppe-moi du silence de ton corps blanc comme un lys’) and he completely rewrites the last strophe, also no doubt for reasons of pudeur. In the event this Sérénade seems inspired by two Duparc songs—both in slow triple time—Extase and Soupir. In all three cases there is a debt to the mood and piano writing of Träume from Wagner’s Wesendonk Lieder. In counterpoint to the vocal line, the little finger of the pianist’s right hand sustains a never-ending swooning melody; this unfolds over smooth undulations of quavers which turn this way and that in never-to-be-satisfied chromatic exploration. The vocal line is wide-ranging and not without its carefully judged surprises: the phrase ‘caressant l’air’ in the last strophe calls for a jump of a seventh into the head voice, and at the end of the song, exquisite excursion heavenwards (a jump of a ninth) on the phrase ‘frissonant et clair’. 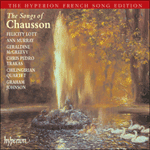 This song illustrates Chausson’s attraction to the décadence; despite its muted mood it displays a type of vocal and emotional extravagance rare in this composer. Du silence argente des lys. Sous un soir frissonnant et clair. Give me peace and make me pure. The silvered silence of lilies. On an evening thrilling and clear.